I’ve just returned from our 2.5-week field course in the Southwestern United States. The 2016 version of Geology 310 started and finished in Las Vegas, making a 3,200 km (2,000 mile) loop across the Basin & Range and Colorado Plateau provinces. All together there were 27 of us, and we (and our gear) filled 3 vans. The Geology 310 field course is a class that takes William & Mary geologists to distant locales to explore landscapes and do geology in the field. 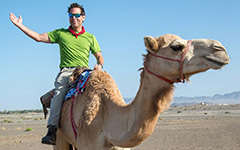 Over the past decade we’ve run trips to the Bahamas, California, Hawaii, the SW United States, and west Texas. 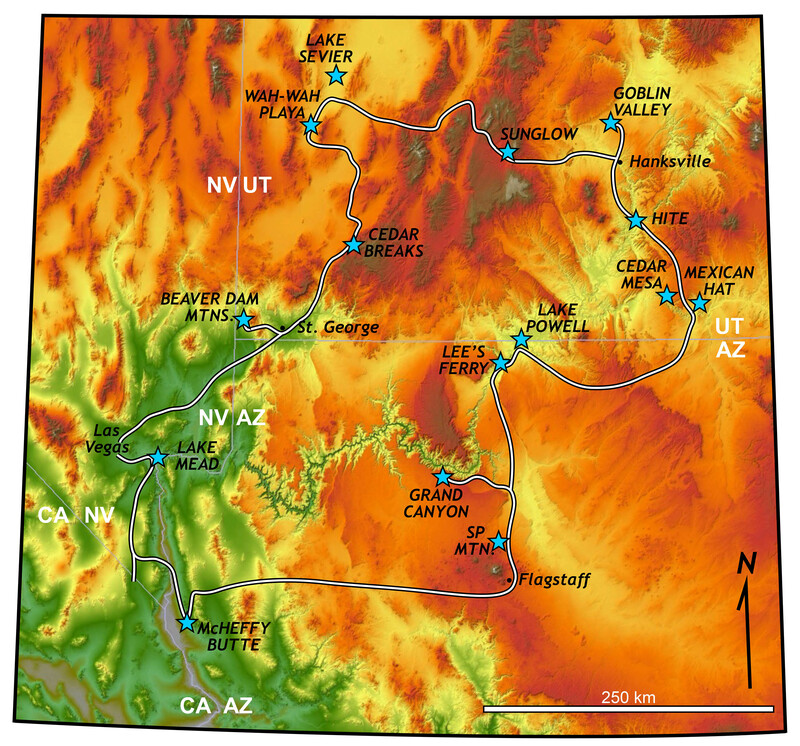 Shaded relief map of the 2016 William & Mary Geology 310 route across Nevada, Arizona, and Utah. This was the 10th time that I’ve led a field course to Arizona and Utah, and the 2016 trip was stellar – with a cadre of adventurous and interested students. The weather was brilliant for much of the trip, and my faculty colleagues Jim Kaste and Becky Jirón, as well as TA Megan Flansburg (W&M Geology ’15), were a pleasure to work with. 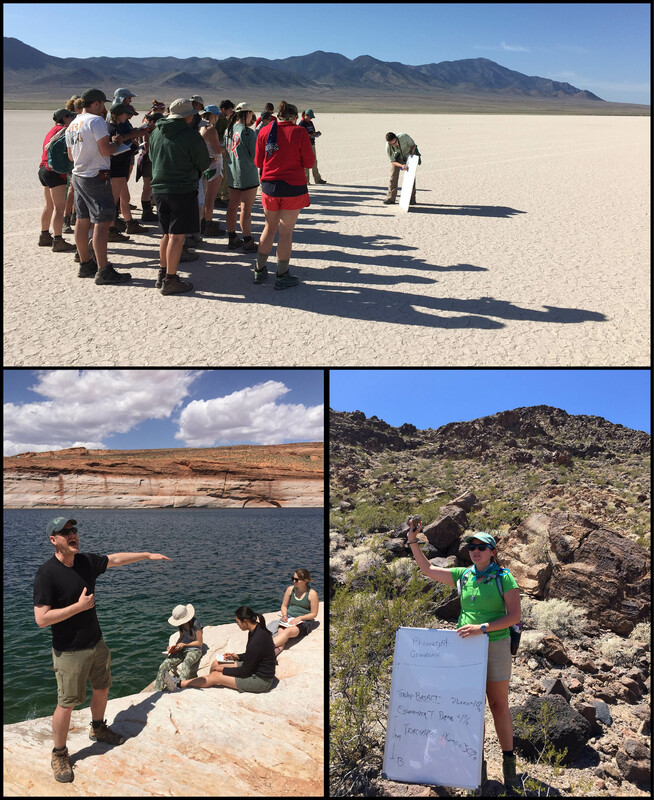 Teaching Moments: top– Becky Jirón and an attentive group at Wah Wah playa, lower left– Jim Kaste holds forth on Lake Powell’s ‘bath tub rim’, lower right– Megan Flansburg discusses the finer points of volcanic rocks at McHeffy Butte. Our 16-day road trip took us to the top of volcanics in northern Arizona, to the bottom of the Grand Canyon, out onto the salty flats at Wah Wah playa, and even into the late spring snow at Cedar Breaks. We camped in scenic spots. At Cedar Mesa, with its commanding view of Monument Valley, we struggled to cook our dinners in 50 mph gusts, at Goblin Valley we played capture the flag amongst the rocky hoodoos, and near Lake Sevier we watched a magnificent sunset from atop an old Pleistocene shoreline. More images from the trip in our photo gallery on the Geology department website. Check out the weather video below, recorded on a windy afternoon in northern Arizona. Is that atmosphere stable or unstable? Some of our field projects included working out the landscape history at the Grand Falls of the Little Colorado River, analyzing the stream chemistry at Lee’s Ferry, terrace mapping along the Fremont River, bedrock mapping at Sunglow Canyon, and fault mapping in the Beaver Dam Mountains. A central theme of the trip was the Colorado River and the impact that humans have had on both the river and riparian system. The waters of the Colorado are dammed behind the massive walls of both the Hoover Dam and the Glen Canyon Dam creating Lake Mead and Lake Powell, and these dams greatly alter the character of the Colorado River: at Lee’s Ferry, 10 km downstream from the Glen Canyon Dam, the Colorado runs clear and cold – a consequence of water released from deep in Lake Powell. Prior to being corralled behind dams the Colorado was a turbid and sediment-rich river. The undammed Paria River is awash in both suspended and dissolved load, and its murky natural waters provide quality habitat for native fish such as the humpback chub (our favorite species of the trip!). William & Mary geologists measuring the suspended and dissolved loads just downstream from the confluence of the Paria and Colorado rivers at Lee’s Ferry, Arizona. Changes in regional climate have lowered the water level in both Lake Mead and Powell to near record levels. Lake Mead is a whopping 40 m (130’) lower than it would be at full capacity, if the water levels in both reservoirs drop much more their ability to generate hydroelectric power will be greatly compromised. At the upper end of Lake Powell, the boat ramp and recreation site at Hite, Utah sits unused high and dry above the Colorado River. These are profound environmental changes, and they are taking place not at a slow geologic rate, but at a discernible human time scale. It’ll be intriguing to see what changes occur in the Colorado River system over the next decade, and just how society responds to those changes and the challenges they bring. Lake level elevations at Lake Mead and Lake Powell (1970-2016). On this long field course we spent hours in the vans rolling down the highways and byway of Arizona, Utah and Nevada; and it’s in those enclosed spaces that we got to know each other. I can dutifully report that 21st century college students, enamored as they are with their digital devices and heavily invested in SnapChat and Facebook, are also big fans of the Beatles. Clearly, the Beatles are timeless, as we listened to more of the Fab Four on this trip than ever before. I also learned some new terms from my traveling companions; in modern parlance a brick can be used as a unit of either distance or time, and fam is a term of endearment used to describe people you are close to. For context, I’ll use these terms in a sentence: My fam and I were about two bricks from Mexican Hat; we were having a sweet time belting out Beatles tunes as we rolled down the long and winding road. Use whatever jargon you wish, this was a positively memorable trip. 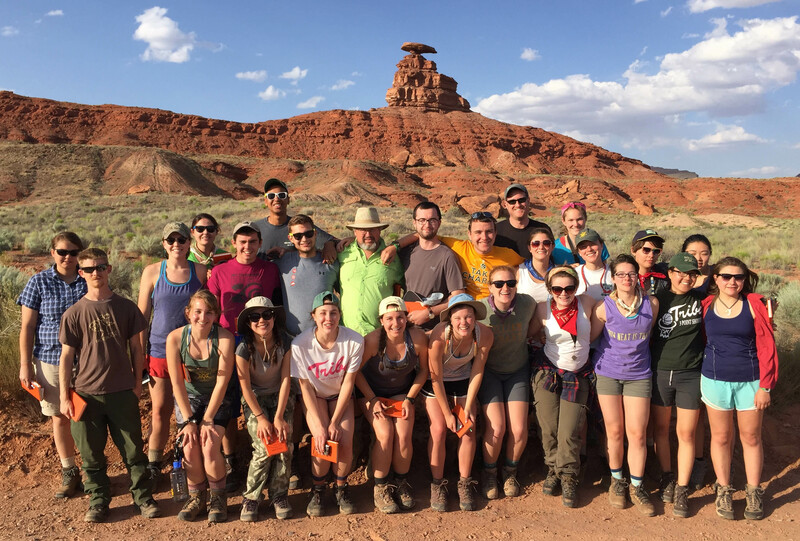 The 2016 W&M Geology 310 class strikes a pose in front of Mexican Hat in southeastern Utah. Good to see lots of ladies representing the next generation of geologists! Sounds like a great trip.